King Rukmangatha of Surya vamsha undertook Ekadasi Vrata here and gifted away all the Punya to the Devas and helped them reach Devaloka. The temple is called Sahadeva Pratishta as Sahadeva undertook the renovation. There are sannadhis for Krishna and Nrisimha here. There is an interesting story about this temple. Normally the temple timings in malai nadu divya desams are very firm. The maali (servant) who used to open the doors of the temple daily at 5:00 am was late by a few minutes on one day. The devotees were waiting outside the temple for the servant to open the temple doors. Perumal could not tolerate this act and cursed him to turn to stone in front of the temple until the kaliyugam ends. Even today the statue of that person can be seen in front of the temple. The Moolavar found in this sthalam is Athpudha Narayanan. He is also named as "Amirutha Narayanan". He is found in Nindra Thirukkolam facing his Thirumugham along the east direction. 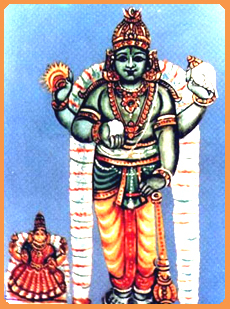 Prathyaksham for Rukmaangadhan.